TORONTO, ON – October 9th, 2018 – The Toyota Tacoma is the legend – built on more than 80 years of creating trucks designed to conquer the harshest terrain and weather on the planet. 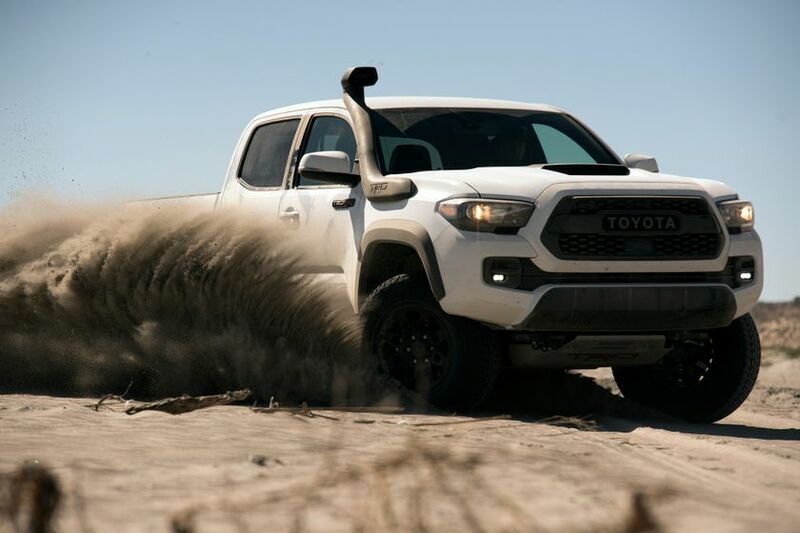 And for 2019, Toyota offers the popular pick-up truck in a range of models and trim levels, highlighted by an enhanced pair of Toyota Tacoma TRD Pro editions that are more capable than ever. So what are you waiting for? A great pick-up truck starts with performance – and in the Tacoma, that means a powerful, responsive and efficient powertrain. Most Tacoma models are built around Toyota’s proven 3.5L V6 engine. This engine delivers up to 278 horsepower and 265 lb-ft of torque, and is outfitted with a long list of advanced technologies to maximize power and efficiency while minimizing emissions. All models with the 3.5L engine are also standard equipped with a Class IV weight distribution tow hitch, 7-pin wiring harness, and Trailer Sway Control technology. For those seeking maximum fuel efficiency, some models are built around a 2.7L four-cylinder engine that generates up to 159 horsepower and 180 lb-ft of torque. Depending on model, the Tacoma features either a six-speed manual transmission or six-speed automatic super electronically controlled transmission with lock-up torque converter. 4×2 models are driven on the rear axle, while 4×4 models feature on-demand one-touch 4×4 systems, with an auto limited slip rear differential, two-speed transfer case, and automatic disconnecting differential. Tacoma’s athletic styling gives it immediate curb appeal, with a sculpted front bumper, smooth rear deck, integrated tailgate spoiler, and double-walled composite cargo bed. Inside, the Tacoma cabin is spacious and features many standard amenities to make it a comfortable place to spend long days on the road or trail. New for 2019, all Tacoma models now include dual USB inputs on the audio system. Other standard features include a Display Audio system with touchscreen and steering wheel-mounted controls, Bluetooth® connectivity, a backup camera, GoPro mount, a multi-information display and plenty of thoughtful in-cabin storage. The Tacoma is also the compact pick-up that delivers full-size safety: Every Tacoma is outfitted with Toyota Safety Sense P – an industry-leading bundle of active safety technologies included as standard equipment on 95 percent of all new vehicles Toyota sells in Canada. TSS P features the Pre-Collision System with Pedestrian Detection, Lane Departure Alert, Automatic High Beams, and Dynamic Radar Cruise Control. These work together to enhance driver capabilities to mitigate collisions, stay in lane, and see at night. Other safety systems include the Toyota Star Safety System, eight airbags – including driver and front passenger knee airbags, and more. The 2019 Toyota Tacoma Access Cab is offered in 4×2 (Starting MSRP: $31,525) and 4×4 (Starting MSRP: $37,540) configurations. This model features room for up to four adults, a six-foot cargo bed, 2.7L four-cylinder engine plus six-speed automatic transmission, and a 3,500 lb (1,590 kg) towing capacity. The 2019 Toyota Tacoma 4×4 Access Cab V6 SR5 (Starting MSRP: $39,085) features room for up to four adults, a six-foot cargo bed 3.5L V6 engine plus six-speed automatic transmission, and a 6,500 lb (2,950 kg) towing capacity. Other features include an auto-dimming rear view mirror with integrated compass, sliding rear window, leather-wrapped steering wheel, 16” alloy wheels, a 400-watt power outlet in the cargo bed, and more. This model may be enhanced as the 2019 Toyota Tacoma 4×4 Access Cab V6 TRD OFF-ROAD automatic (Starting MSRP: $40,925), which adds 4-wheel crawl control and multi-terrain select systems, a rear differential lock, all-terrain tires, dual-zone automatic climate control, heated front sport seats, the Toyota Smart Key System with Push Button Start, integrated garage door opener, chrome grille, black fender flares, anti-theft system, LED daytime running lights, a Premium Display Audio system with 7” screen and navigation, active traction control system, Bilstein shock absorbers, tire pressure monitoring system, and more. The 2019 Toyota Tacoma 4×4 Access Cab V6 TRD OFF-ROAD manual (Starting MSRP: $39,980) features room for up to four adults, a six-foot cargo bed, 3.5L V6 engine plus six-speed manual transmission, and a 6,500 lb (2,950 kg) towing capacity. Other features include a premium Display Audio system with 7” screen, integrated Sirius XM Satellite Radio, advanced voice recognition and a navigation system, dual-zone automatic climate control, TRD off-road 16” alloy wheels, exterior mirrors with integrated signal lamps, a rear differential lock, all-terrain tires, dual-zone automatic climate control, TRD grade fabric seats, heated front seats, leather-wrapped steering wheel and shift knob, integrated garage door opener, mesh black chrome grille, black fender flares, anti-theft system, LED daytime running lights, active traction control system, Bilstein shock absorbers, and more. The 2019 Toyota Tacoma 4×4 Double Cab V6 TRD OFF-ROAD automatic short box (Starting MSRP: $42,940) features room for up to five adults, a five-foot cargo bed, 3.5L V6 engine plus six-speed automatic transmission, and a 6,400 lb (2,900 kg) towing capacity. Other features include a premium Display Audio system with 7” screen, integrated Sirius XM Satellite Radio, advanced voice recognition and a navigation system, dual-zone automatic climate control, TRD off-road 16” alloy wheels, exterior mirrors with integrated signal lamps, a rear differential lock, all-terrain tires, dual-zone automatic climate control, TRD grade fabric seats, heated front seats, leather-wrapped steering wheel and shift knob, integrated garage door opener, mesh black chrome grille, black fender flares, anti-theft system, LED daytime running lights, active traction control system, Bilstein shock absorbers, and more. This model may be enhanced with the available TRD PRO package (Starting MSRP: $56,435). New for 2019, the TRO PRO model now features a high-mount desert air intake, a JBL Premium Audio system, black chrome exhaust tip, an updated TRD skid plate with red logo and a moonroof. Other features include a TRD stainless steel exhaust system, Fox shock absorbers, TRD remote reservoir suspension kit, TRD-tuned front coil and rear leaf springs, 16” black alloy wheels with TRD centre cap and all terrain tires, TRD PRO black leather seating, a hood scoop, heritage TOYOTA front grille, TRD PRO shift knob, Rigid Industries LED fog lamps, black bezel headlamps and tail lamps, and more. The 2019 Toyota Tacoma 4×4 Double Cab V6 TRD SPORT manual short box (Starting MSRP: $41,740) features room for up to five adults, a five-foot cargo bed, 3.5L V6 engine plus six-speed manual transmission, and a 6,400 lb (2,900 kg) towing capacity. Standard features include sport tuned shock absorbers, 17” alloy wheels, hood scoop, a premium Display Audio system with 7” screen, integrated Sirius XM Satellite Radio, advanced voice recognition and a navigation system, dual-zone automatic climate control, exterior mirrors with integrated signal lamps, a rear differential lock, all-terrain tires, dual-zone automatic climate control, leather seating, heated front seats, leather-wrapped steering wheel and shift knob, integrated garage door opener, the QI Wireless Charging system for personal electronics, Blind Spot Monitor and Rear Cross Traffic Alert safety systems, anti-theft system, LED daytime running lights, power moon roof, and more. This model may be enhanced with the available TRD PRO package (Starting MSRP: $52,870). New for 2019, this TRO PRO model includes a high-mount desert air intake, black chrome exhaust tip, an updated TRD skid plate with red logo and a moonroof. Other features include a TRD stainless steel exhaust system, Fox shock absorbers, TRD remote reservoir suspension kit, TRD-tuned front coil and rear leaf springs, 16” black alloy wheels with TRD centre cap and all terrain tires, TRD PRO black leather seating, a hood scoop, heritage TOYOTA front grille, TRD PRO shift knob, Rigid Industries LED fog lamps, black bezel headlamps and tail lamps, and more. The 2019 Toyota Tacoma 4×4 Double Cab V6 TRD SPORT (Starting MSRP: $42,170) adds a sport tuned suspension, 17” alloy wheels with all-season tires, dual zone automatic air conditioning, LED daytime running lights, front sport seats, TRD grade fabric seating, the Toyota Smart Key System with Push Button Start, an integrated garage door opener, a hood scoop, 7” Display Audio system with navigation, power sliding rear window, a tire pressure monitoring system, and more. The 2019 Toyota Tacoma 4×4 Double Cab V6 TRD SPORT UPGRADE (Starting MSRP: $44,305) includes all the features in the TRD SPORT package, plus a power moon roof, leather seating, the Blind Spot Monitor and Rear Cross Traffic Alert safety systems, and the Qi Wireless Charging system for personal electronics. For the ultimate in comfort and technology packages, plus go-anywhere adventure, the 2019 Toyota Tacoma 4×4 Double Cab V6 Limited short box (Starting MSRP: $48,390) features room for up to five adults, a five-foot cargo bed, 3.5L V6 engine plus six-speed automatic transmission, and a 6,400 lb (2,900 kg) towing capacity. New for 2019, this model now includes a power tailgate lock. Other features include a premium JBL Display Audio system with 7” screen, seven speaker, advanced voice recognition and navigation system, dual-zone automatic climate control, 60/40 split fold-down rear seats, premium leather seating, heated front seats, leather wrapped steering wheel and shift knob, integrated garage door opener, the Toyota Smart Key System with Push Button Start, the Qi Wireless Charging system for personal electronics, clearance and back-up sonar system, the Blind Spot Monitor and Rear Cross Traffic Alert safety systems, an anti-theft system, tire pressure monitoring system, power moon roof, unique 18” alloy wheels, dual chrome exterior mirrors with integrated signal lamps, bar-style grille with chrome surround and exterior chrome accents, LED daytime running lights, chrome side step bars, and more. The 2019 Toyota Tacoma is now on sale at Toyota Dealers across Canada. For complete and up to date details and specifications, visit www.toyota.ca/tacoma.